Whether you're requesting a pony ride ring or camel and elephant rides, we can hook you up. Do you want something special that the little ones will remember? 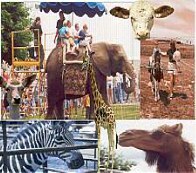 How about a complete petting zoo where they can actually touch, feel and interact with Zebras, deer, Llama's,kangaroo,wart hogs, etc.? Event planners, we can help you make an impact at your next themed event with our complete list of clean and well trained exotic birds, monkeys, tigers, snakes and yes, even bears!